And it could deregulate “white collar” jobs. You might have thought the prospects for an immigration reform bill were dead on Capitol Hill, but elsewhere in Washington, policymakers could soon retool the immigration system through a different legislative pipeline: an obscure trade deal that treats workers as global commodities. The Trade in Services Agreement, or “TiSA,” is being drafted up as a set of commercial rules that would shift labor migration by deregulating the global service economy. In plain English, that means the trade rules would “liberalize” the importation of professional and service workers from a huge range of sectors. Like the Trans-Pacific Partnership, TiSA could roll back regulations on, for example, importing a programmer from a company’s Mumbai branch or transferring a bookkeeper to handle overseas accounts. The 38 designated job categories include: Building work, tour guides, hotel and restaurant service workers, computer hardware technicians, and midwives and nurses. Advocates fear this could dramatically broaden the use of unregulated foreign workers in US companies, and undermine already-weak safeguards against the exploitation of immigrants in service fields. While it’s unclear how much this might apply to US companies if TiSA is ultimately adopted, Daniel Costa at the think tank EPI says the “Movement of Natural Persons” provisions would likely apply to two multi-year “professional” visas, the L-1, for transferring executive, managerial or special “knowledge” workers within a multinational; and the B-1 for “business visitors” temporarily in the US to, for instance, attend a conference. Migrant labor abuse is obviously nothing new in the US. But some fear TiSA could do to “white collar” service jobs what NAFTA did to manufacturing: dismantle legal restrictions on exploitation of both material resources and workers. Current safeguards on immigrant labor programs are designed not just for “protectionism” but to prevent companies from manipulating guest-workers to avoid fair labor standards like wage-and-hour rules (typically more loosely regulated for visa-based workers). But even now, as with the more common labor visas for tech workers, enforcement is anemic. Plus these special business visas do not cap the number of “human resources” companies can ship around. Following the TiSA leak, in an opposition statement by a global coalition of rights groups, Tony Salvador, a labor lawyer with the Philippines-based advocacy group IDEALS, warned that in any trade deal, “the host country should maintain its prerogative to pass and implement immigration and national security laws, and apply them to both migrant workers and foreign service suppliers,” to keep corporations from using regulatory arbitrage to avoid human rights conventions. 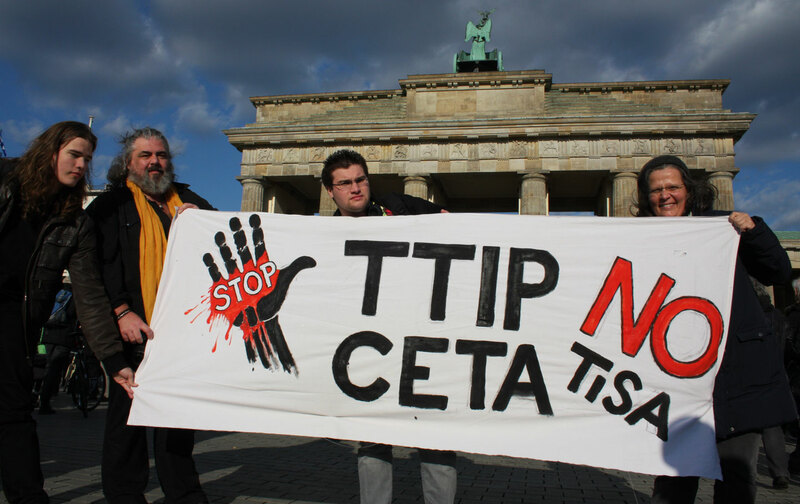 TiSA might also enable corporations to sue governments through investor-state tribunals. Under NAFTA and other trade agreements, companies have used these corporate courts to seek to strike down public interest regulations, like environmental or labor laws, for supposedly impinging on investors’ “rights” to profit. According to Costa, a country like India could potentially sue the US government “for something as simple as raising visa fees” or imposing a minimum wage. And there’s more free trade lurking on the Hill. Trade ministers have been drafting a cousin of the TPP, Transatlantic Trade and Investment Partnership (TTIP), to bring on another deregulatory surge on sectors like financial management and even public healthcare—penetrating fields once seen as relatively safe from outsourcing. The debate around the TPP revealed underlying realities of globalization: while corporations expand their powers to elide public-interest protections, transnational business pacts ultimately reward trade partners for suppressing social and economic rights, enabling companies to effectively import low standards and export negative consequences. Congress meanwhile has been reassuring anti-TPP activists that there will be adequate safeguards built into the deal, and recently added a caveat to the fast-track bill ensuring that it would not alter federal immigration policy. But however the White House might use its executive power to grease through these giant economic pacts, trade liberalization inevitably growing corporate power at the expense of democracy. If workers are recast as “service suppliers,” companies might be “freer” to trade their labor for profits in the global marketplace, but their rights are simply traded away.